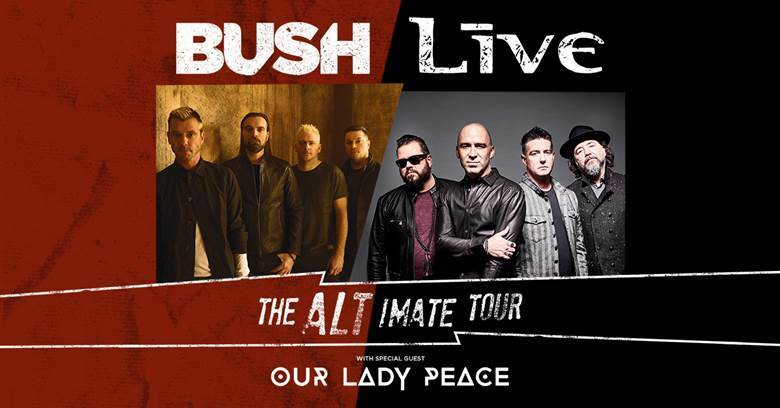 BUSH and +LIVE+ are joining forces for The ALT-IMATE Tour, a high-powered co-headline summer run that will see these two iconic acts celebrating the 25thanniversary of their respective landmark albums Sixteen Stone and Throwing Copper. Produced by Live Nation, this hits-packed road show will hit arenas and outdoor amphitheaters in 34 cities across the country, kicking off June 6th in Mashantucket, CT with stops in Boston, Los Angeles, Atlanta and more before wrapping September 8th in Rochester, MI at Meadow Brook Amphitheatre. Tickets go on sale to the general public beginning Friday, March 15th at 10 AM local time at LiveNation.com. Citi is the official presale credit card for the tour. As such, Citi cardmembers will have access to purchase presale tickets beginning Tuesday, March 12th at 10 AM local time until Thursday, March 14th at 10 PM local time through Citi’s Private Pass program. For complete presale details visit www.citiprivatepass.com. Artist presales are also available now through Thursday, March 14th at 10 PM local time, visit https://bushofficial.com/tour or https://freaks4live.com/home.html. VIP ticket packages will also be available for BUSH start next week, which will include tickets, meet & greet with the band, exclusive merchandise, and side stage show viewings.